Staples sophomore Remy Nolaan scores a goal against Greenwich on Saturday in a 12-4 loss. Nolan was tenacious all game with four ground balls, four forced turnovers, one interception and two draw controls. Not having your leading scorer in the lineup against one of the best teams in the state. The Staples girls lacrosse team faced this situation on Saturday when it was missing sophomore leading scorer Maeve Flaherty from the lineup because she was at grandmother's funeral against state powerhouse Greenwich at home. The 5-10 Flaherty does a lot for Staples because of her height and her 21 goals and three assists through six games shows she's strong at finishing. Greenwich took advantage and left Westport with a 12-4 victory. "It made a pretty big difference," Lady Wreckers Coach Cathy Schager said. Staples adjusted its lineup as well, which made a difference, but the team isn't out to make excuses. "When you change the dynamics on the field, it's hard to adjust," Lady Wreckers senior captain Kat Kreiger said. "Maeve is a talented player but we're definitely a team [and needed to pick it up in her place]." Junior Nikki Seo normally sets up Flaherty with ease and not having her to pass too made a difference. Seo said, "The dynamics changed with people in different places. We tried our best but it wasn't there for us. We definitely miss Maeve." For the first 11 minutes of the game, Staples showed it was ready for prime time and stepped it up, outplaying the Lady Cardinals while MSG Varsity was televising the game. The Lady Wreckers had the ball in Greenwich's zone for most of this span and took a 1-0 lead with 23:47 remaining in the first half when Seo (two goals, one assist, three ground balls, one draw control) circled around the net and scored. "I'm very proud of them," Schager said. "Our defense and defensive transition did a wonderful job." Lady Cardinal senior captain Sarah Kramer (five goals, two assists) tied it with 21:59 left off a feed from junior Maddie Johnson (one goal, two assists). Following the goal, Staples controlled play with sophomore Remy Nolan (one goal, four ground balls, two draw controls, four forced turnovers, one interception) serving as a catalyst. Nolan went after the loose ball with a vengeance and her ability to outplay her opponent during faceoffs allowed a teammate to control the draw. "Maeve wasn't here and I wanted to step it up for her and the team," Nolan said. "I tried my hardest." Krieger, (four ground balls, five caused turnovers, one draw control, one interception), senior captain Lexa Koenig (three ground balls, one caused turnover) and classmate Jess Leskin (two caused turnovers, one interception) held their ground on defense and kept the ball out of their zone. The Lady Wreckers had many scoring opportunities with Nolan firing five shots, Seo and sophomore Jessie Ambrose launching four shots each and sophomore Adele Mackey placing three shots on net. Of the quartet's shot, eight were free shots. However, Greenwich senior captain goalie Kaitlin Bedford was too formidable and made 10 saves while allowing two goals and robbed Staples blind. Sophomore Hannah Jeffrey relieved Bedford midway through the second half and made four saves while allowing two goals. "Our shots weren't on today and when I scored, I took extra time to study the goalie," Seo said. Schager said, "Our offense and our offensive transition weren't on today. 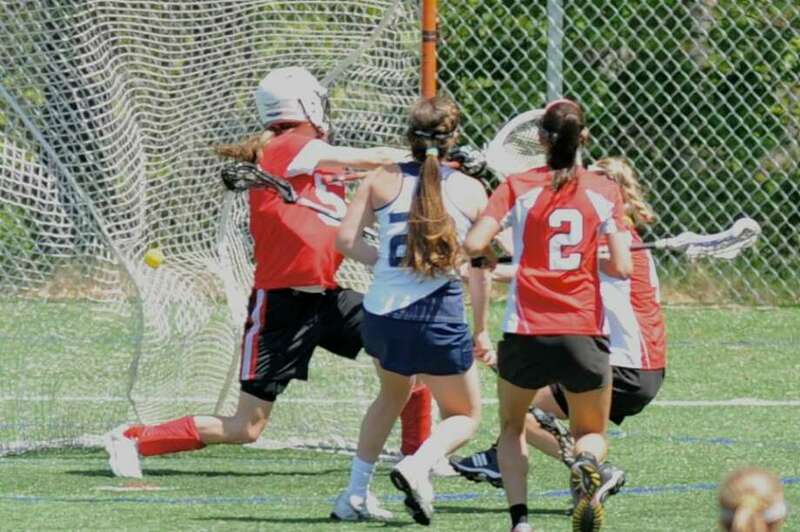 Greenwich has a great goalie, one of the best goalies in the state, and their defense did a nice job of pressuring us." With 13:51 to go, Lady Cardinal Coach Caitlin Keane didn't like what she saw and called a timeout. Keane's charges adjusted adjusted and took the lead for good, 2-1 with 13:18 left on Johnson's free shot. Kramer then displayed why she will be going to play for the University of Richmond next year and added two goals to make it 4-1 with 10:03 remaining. Staples hung tough and played tight defense. Junior goalie Penny Tsilfides (13 saves) made some impressive saves against a relentless Greenwich attack. With 3:35 to go, Seo was awarded a free shot and scored but because the Lady Cardinals committed a false start, the goal didn't count and the Lady Wreckers weren't able to decline this infraction. Seo shot it again and 22 seconds later, Bedford made the save. "The Greenwich goalie was good to adapting to our shots and was ready for the second one," Seo said. "Every goal makes a difference as far as momentum goes. We had other opportunities and the game wasn't there for us." Greenwich added a goal before the half to take a 5-1 lead at the break and extended its lead to 8-1 before Nolan scored off a feed from Seo with 16:13 left in the game. Seo and Ambrose tallied goals in the last 10 minutes of the game with the latter scoring Staples' only goal on a free shot. Senior lefty captain Blair Barone (three ground balls, one caused turnover) and junior Elizabeth Driscoll (three draw controls, two ground balls) also contributed for the Lady Wreckers. Staples also missed sophomore Ali Crofts, who seven goals and two assists through three games. Crofts has been out since suffering an injury but expects to be back soon. "Our offense struggled and Greenwich had a strong goalie," Krieger said. "We held the ball for too long."